What’s going on here? Stock prices are historically inexpensive. Bond yields need a magnifying glass to detect. Earnings reports have been positively surprising for eleven consecutive quarters. There are trillions of institutional and retail investor dollars sitting on the sidelines waiting to propel the market directly to the moon. So why is the market trending sideways? Global concerns are anticipating the possibility of what the Wall Street insiders call left tail risk. To explain this phenomenon we must also look at how financial planners and institutional traders model their portfolios. Many financial planners will set up the investment portfolios for their clients based on the Modern Portfolio Theory (MPT). I discuss this in detail on pages 93 – 96 of my latest book. MPT is a portfolio optimization methodology which attempts to maximize our portfolio expected returns for a given amount of portfolio risk, or stated differently, minimize risk for a given level of expected return by selectively choosing the proportions of various assets. Risk is defined as the standard deviation of return which sheds light on the historical returns of the various assets. It shows how much variation or dispersion there is from the average. A low standard deviation indicates that the data points tend to be very close to the average or mean, whereas high standard deviation indicates that the data points are spread out over a large range of values. There is more risk in the latter. This is reflected in our option premiums as well in that the more risk in the underlying, the greater the premium returns. The green shaded area between the red and blue lines reflects the area of left tail risk or the greater chance of a negative movement past 3 standard deviations. If the red line results in a positive result past 3 standard deviations (right side of the graph) it is referred to as right tail risk. Left tail risk is inhibiting institutional investors from moving all that cash into the market. As a result, liquidity is depressed, bid-ask spreads are wider and favorable trade executions for the “big boys” becomes more difficult and the process snowballs. The prospect of left tail risk is impacting our current stock investments as institutional investors cannot depend on normal distribution models for their investments. This is keeping trillions of investment dollars on the sidelines and creating unusual market volatility which is no friend of conservative covered call writers. 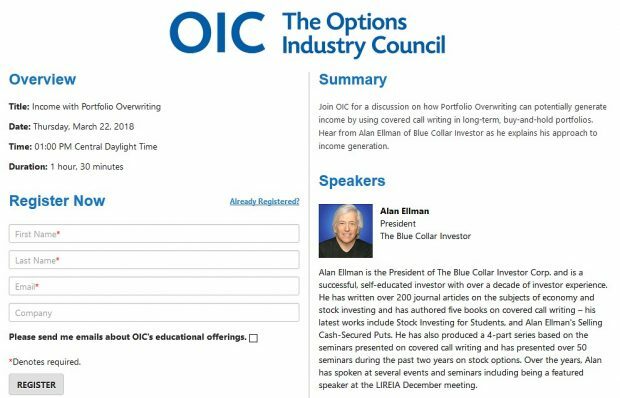 Blue Collar Investors can elect to stay on the sidelines or take defensive actions such as writing in-the-money strikes, buying puts or selling cash-secured puts (premium members see the emergency management report in the “resources/downloads” section of the premium site). Having an understanding of concerns of institutional investors and the models they use for their investments decisions will make us all better and more educated investors. For the week, the S&P 500 declined by 2.5%, for a year-to-date return of 1.3%. BCI: Cautiously bullish, fully invested, favoring in-the-money strikes. For the past several weeks (maybe longer) you have described your market outlook as “cautiosly bullish” despite the situation in Europe. Can you explain in more detail? I’m mostly on the sidelines with my money in the bank doing absolutely nothing. Thanks. When is your new book coming out in kindle? Cautiously: This is 90% related to Europe and right now more specifically Greece. I can’t see this issue NOT getting resolved (double negative…I believe it will be resolved). The other 10% is a combination of a stagnant jobs market, a sluggish housing market and the most mean-spirated politics I have ever seen (time to clean house!). 1- As I stated in this article, stocks are historically inexpensive trading at a PE under 12 when the normal range is between 14 and 15. Stocks are “on sale”. 2- Corpoprate earnings are extremely impressive. Three stocks have had a positive surprise in the 3rd quarter for every one with a negative surprise. I like those odds! 3- The 10-year note yields 2.1%…for the year! I just can’t get excited over that prospect. The earnings yield of the market is over 8% (inverse PE…1/12). 4- As I stated in this article there are trillions of dollars on the sidelines which will eventually fuel a bull market. 5- Economic reports have been mixed but pointing to a recovering, albeit sluggishly, economy. GDP stats have been improving quarter after quarter. 6- Historically we always get through these difficult periods and the stock market goes up, just check the charts. This all adds up to “cautiously bullish”. My publisher tells me the kindle version will be available on Amazon.com this coming week. I’ll post a comment on this blog when I get word that it’s available. There is a tremendous amount of computer trading out there. We are talking hundreds of millions of shares each week. These trades are based on nothing more than a computer algorithm, which, on minute by minute trading period may be profitable. Up against this are “investors” who are buying and selling the stocks based on their business line, profitability, new trends, new competition, etc. W can’t compete against a computer that takes a half cent profit on an eight million share trade, but the computer is in and out so fast for that half cent that it is still the investors who move the stock by dollars. The BCI play the trend. If the stock is on a reasonable uptrend, we try to grab a month’s worth of profit off that trend. I do not use rules, such as, is the price more than 2% above the 30 day, or 60 day moving average, or some such nonsense. I bought RVBD at $23.53 on Sept 19, and sold the OCT $23 call for $2.42. The stock was called away on On October 21. I am still not sure what Riverbed does, but I know that it was a popular stock (it closed at $28.98 yesterday). No, I didn’t make $5 on the stock from $23 to $28. I made an 8.2% profit ($1.89 / $23) in one month on a popular stock. I didn’t use computer models, a Ouija board or a pigeon’s entrails. I picked a popular stock, in a month without earnings reports, with a reasonable return on the option premium. I did not try to double my money, nor did I hide under a bush, and accept one quarter of one percent because I am scared. Did I take a risk? Yes. It was a risk I felt was reasonable at the time. Does Greece matter to Riverbed. Nope. Does Riverbed care about the condition of the euro? Be very careful in today’s market. I think there is entirely too much computer trading without any human thought behind it. I think Greece isn’t the reason behind some of the market movement, it’s the computer traders, and Greece is just the talking head’s excuse for the market movements, today. Tomorrow it will be California’s debt, a hurricane in Indonesia, or the current phase of the moon. Warren Buffet has the best attitude. He said he wouln’t care if the market closed for a year. the current stock price is just someone’s opinion. If the opinion is stupidly low, buy it from the morons. If the opionion is stupidly high, sell it to the morons. We don’t care if the market is right or wrong, as long as the current trend in our selected stocks continues through the next expiration date. A reminder for those who also invest for dividend income: Many Limited Partnership companies are currently trade on the NY stock exchange, just like corporate stocks. THEY ARE NOT THE SAME! Example: SPH is Suburban Propane Partners, LP. If you look at the stock tables, or most stock research sites, the “dividend yield” is 7.1% based on the 11/03 closing at $48.19. First, it NOT a dividend. You will not be taxed at 15% on this money. You will be taxed at whatever your tax return final rate is. Second, you will not be taxed on the “dividend”. The “dividend” is simply a partnership distribution. It may, or may not, bear any resemblance to the actual income earned by your shares. That income will be reported to you on a form K1. If you want dividend income from a publicly traded CORPORATION make sure it is a corporation, NOT a limited partnership. Alan received your new book and its a great source in one location. I review it daily, just looking at different chapters to refresh on the subject. I am finding new material each time I pick it up. Just two comments about the book. I like the large print but is is very light and hard to see at time. I sure wish it was slightly darker or one shade under the bold. Thanks again for the great resource book. I’m in the process of reading your new book not just scanning it. I’m not going to go back and check but it seems you improved much of what was in the other books. I love – great job. One question – mid-month strategy where the stock has gone up considerably over your strike you say to buy back the option when it isn’t worth much sell the stock and enter a new position. The book example shows the option time premium dropping to 11c. I just don’t see that big of a drop. Just how low by proportion would you consider low enough? Some additional examples and guide lines appreciated. I, for one, want to thank you for your contributions on this site. They are always informative and thought-provoking. Sometimes funny. Keep up the good work. Thanks for the suggestion and generous remarks. I’ll speak with my publisher about this issue. Like Alan, I want every one of the BCI to have the confidence to do it without a money manager. Any additional tidbit of information I can give, that adds to that confidence, is worth my time. As for the humor, that is just so people don’t get bored. Too much of the investing literature out there is drier than the Sahara, and can put a true insomniac to sleep in five minutes. Brain surgery and astro physics are probably a bit too complicated for simple bits and pieces. The stock market is not. We are not trying to be right all the time. We are not trying to be the first to get a good idea, or the first to get out of a bad one. We are just tagging along with the big guys, trying to pull a few scraps of profit off here and there, and make what we consider a very nice return on our tiny investments. Great book, I liked the tactic of playing the bid-ask price… I wonder why I didn’t know it before ? I also started to use your calculators now, since it was explained pretty good in the new book. Keep the great job ! The general guideline I set up is “when the time value approaches zero and there is an opportunity to set up a second income stream”. That means that it will cost almost nothing to unwind the trade (buy back the option and sell the stock). Now the cash can be used to generate a second income stream in the SAME month with the SAME cash. Another guideline would be that if you can generate a greater amount of cash (ROO or time value) in the new position than it cost to unwind (time value to buy back the original short option position) then it is a strategy that should be given consideration. Look for me to give other examples in future blog articles. The Weekly Report for the week ended 11/04/11 has been uploaded to the Premium Members website. How much significance should we be giving to the number of weeks a stock has been on the running list in your weekly reports. For example do we favor a stock like NUS on the list for 16 weeks versus a stock recently put on your list? Thanks for all your great work. Thanks for all the useful info I have received with my Premium Membership. I am trying to figure out if my calls have lost enough time value to be sold now. I understand how to calculate the 20%/10% prices of out of the money calls but how do you do it with in the money calls. I think I am supposed to subtract the intrinsic value before making the calculation but I could use some help. Alan’s response in #13 is a good answer to your question, as well. If you have reached the point where there is very little time value left in the option position it means there is very little profit left for you to earn. When I look at my trades I look at how much is left to earn for the time and risk left in the option. if you have made $1.23 out of the expected profit of $1.36, are you going to hold out for another week, or two, just to earn an additional thirteen cents, or are you going to look at your list of possibles and come up with another trade to make more? BCI is recommending ITC (in the money) calls due to the market instability. Is it best to wait until Nov CC expire before writing calls for Dec expiry aside from exercising exit strategies? By passing the BCI screens a stock is displaying both fundamental and technical strength. A stock like NUS, on the list for 16 weeks, has been a great cc candidate now for 4 months. This is just one of the factors we use when making our investment decisions, not the major one. If you are deciding between two stocks that you like and one has been a great performer for months, the other a recent addition to our premium watch list, I would tend to favor ‘old reliable”. I’m a new member and this is my first note to you. First of all, let me say that so far I am very satisfied with what I am learning from you and your staff. My biggest challenge at this point is learning to control the “gambler” side of my personality and focus on consistent, profitable returns. Just received my copy of your latest book and am looking forward to reading it; however, I must agree with JR that the print is so light it is very difficult to read without strain. Any possiblity of a re-print? Most of my trading for the upcoming/current contract cycle is done on or near expiration Friday for rolling strategies, the first week of a 4-week cycle or within the first 8 trading days of a 5-week cycle. With 2 weeks remaining in the November contracts you should be able to generate 1-2% for this month before entering into the December contracts. This will also give you an opportunity to re-evaluate the stocks you are considering as we approach the current expiration Friday thereby incurring less risk. Welcome to the BCI community and to our blog. Regarding the “gambler” in you…this is a problem many investors have. Just think of all those who invest in penny stocks or trade naked options. These folks are looking for the grand slam homerun, we are hitting singles and doubles all day long. Develop a structured system of investing in a non-emotional way based on fundamentals, technicals and common sense ands stick to it. If you must, open a separate account with cash you don’t need to satisfy the cowboy in you. Thanks for your feedback on the print density of my new book. I will address this with my publisher who is currently working on the kindle version of the book. If any of our members have comments about the density of the print please let me know (good or bad) @ alan@thebluecollarinvestor.com. Thanks for your generous remarks and we look forward to your future posts on this site. I would like to 2nd JR#7 comments about the print. I will admit I don’t have the best eyesight but I have to be in the best light to be able to read it easily. I’ve had no trouble reading the print – I wonder if some of the books were printed with low ink – Alan check some of the books in stock this may be a problem with some of them. Prior to approving the publication of a book, an author receives a “proof” much like we would if we were buying a wedding album. I read and re-read that proof 12 times before giving my okay. To my eyes the print was fine but I did notice that it was slightly lighter than my first two books. The books in stock are of the same print quality as the proof I reviewed. I do recognize that what is right for one may not be right for another and we are always trying to accomodate as many members as possible. I will speak to my publisher and ask that the next printing be made slightly darker. Thanks for the feedback. The Schedule D pages are going to become obsolete. The 2011 Form 1099-B has acquisition date and cost basis information boxes which your broker will be reporting to the IRS. Basically, you will just copy the form onto your Schedule D and file your return. Now, here is the important part: YOUR BROKERAGE MAY BE AN IDIOT. You MUST keep your own calculations so you don’t pay tax on something that the broker got wrong. Sorry about the tone of my #26 post. I did not mean to imply that the Schedule D pages should not be used next year. The can certainly be used to create your attachment for your tax return. The point I wanted to make was that, if you are the type who hates paperwork, the Form 1099-B will now provide the proceeds and cost, and therefore the capital gain, of each trade. You will still be required to put that information on your tax return. I had nio problem reading the book and thought it was easy to read and filled with great facts. I agree with Fred (#30)…I didn’t have any problem with the print. The information is quite readable and the multi-color graphics is great…greatly enhances the understanding of the material. I own close to 100 books on trading and none of them have color graphics. On page 316 of your new book you talk of “The Premium Report and ETFs”. Can I ask what criteria you use to select ETFs for this list? Thanks for a fabulous book. It’s my new go-to book. Thanks for your very kind words about my new book. Here is a real world example of my response to Jeff in my #17 comment. I entered a put spread on October 21, selling the AAPL Nov $360 put for $3.53 and buying the Nov $350 put for $2.44. That would give me a profit of $1.09 for four weeks. Now, with Apple trading over $405 on Nov 8, the $360 put has fallen to $0.23 and the $350 put has fallen to $0.24. I can buy back the position by giving up my last nine cents profit. In real dollars, given my 3 contract position, we are talking about taking a $301 profit today, instead of waiting until the 19th for that last $27. So, here is my quandry: Can I find another trade that will make me more than $27 in the next 11 days, with the same $3,000 investment? If the answer is yes, I close this trade and move one. If the answer is no, then I let it run a while longer. Will my replacement trade be another November call or put? Perhaps, perhaps not, but the point is that my current position has fallen to the point where it is almost not worth keeping it. This is the kind of discussion you should be having with yourself when you get in the 10%/20% range Jeff asked about in his #16 comment. Comment #29… I agree with you. I would not have bought it since it is too light to comfortably read it. I would have waited for a newer version or read it on the kindle where I could possibly adjust the text but not sure about the print density. If a stock is moving sideways do you recommend an in the money strike price in this environment? I noticed that there are more features on your weekly stock report than you show on the information video. Are you planning to update that video? Also, I want you to know that I am reading your new book for the third time and learn something new each time. Thanks! Excellent point. When a stock hasn’t established a definitive trend and we are in a volatile market, news driven, my preference is to favor the protection of in-the-money strikes. If the market was strongly bullish I would be comfortable with out-of-the-money strikes. Being a dentist, I was wondering if you ever heard of a company called Align Technology and if so what you think of the stock. Thank you. We are in the process of producing a new video updating the recent enhancenments made to the Weekly Stock Screen and Watch List. The BCI team is constantly looking for ways to give our members the best information in a user-friendly venue so look for even more changes as we move forward. The new video will be uploaded to this site within the next 2 weeks. So, remember my post #34? The one where I said I could close my Apple put spread for $27 and move on? Apple is down a $7.83, to $398.40, today. Now I can close that same spread for $364. Coulda, woulda, shoulda. things change quickly in the options market. Sometimes it is best to just take the money off the table and ponder your next move. I’m from Singapore and chanced upon your website 2 months back and found it extremely helpful for me, someone who is new in options and covered call writing. Thank you very much for the efforts in educating people like me..
I’ve read your book “Exit strategy in Covered Calls Writing” and found it easy to understand and follow. However, could you kindly enlighten me on page 125 & 127 – Rolling out and up: OTM & Rolling out and up:ITM? How can the “net return” be different when the assumptions are the same (in column 3)? Thank you, once again, for your kind advice. I am familiar with this company. I use their technology in my office. Basically, they developed a method of correcting mal-aligned teeth with “invisible braces”. It is a wonderful process both esthetic and non-invasive. Great for adult orthodontics (braces). Now as far as an investment vehicle: This stock has not come up in our premium watch lists and that is the primary resource I use for my stock selections so I have never invested with this equity. Welcome to the BCI community. We are grateful for our growing international membership. There is a slight difference in the assumptions. On page 125 (top right) the stock price today is $83. On page 127, the stock price today is $86. This will impact the dynamic of the calculations. Let me know if this adequately answers your question. I was reading your new book and the section on non standard options. My question is: are options terms ever adjusted for REGULAR cash dividends? Generally, a regular cash dividend will NOT impact the terms of an options contract as long as the dividend is less than 10% of the current value of the stock. Italy’s Senate is to vote today and the lower house tomorrow on the austerity measures that will lead to the exit of Silvio Berlusconi as Prime Minister, probably to be replaced by EU technocrat Mario Monti. However, stability is not guaranteed, as it’s not clear how much support Monti will get from Berlusconi’s PDL party, while the Northern League coalition partner has said it won’t back Monti. In Athens, new Greek PM Lucas Papademos is due to name his new cabinet after being appointed yesterday. The political developments have calmed nervous markets, with Italian bond yields continuing to fall today and EU shares rising. We welcome the calm and hope it continues. There could be some thing wrong with your RSS. You should have somebody take a look at the web site. Thanks Devin. I had my webmaster look into this and told me that it has been updated and working properly.